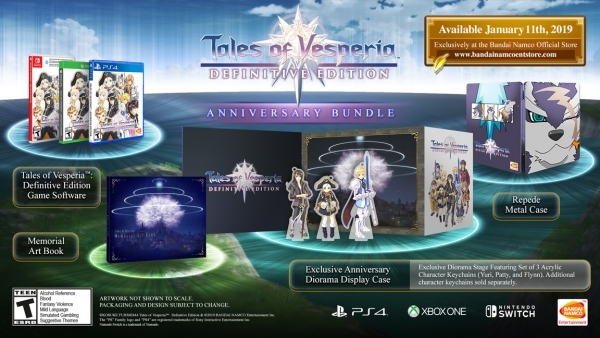 Bandai Namco has detailed the Tales of Vesperia: Definitive Edition “Anniversary Bundle” for the Americas and “Premium Edition” for Europe and Southeast Asia. Available for pre-order now at the Bandai Namco Entertainment America Online Store (PlayStation 4, Xbox One, Switch). Update: Despite the packaging in the image, the Switch version will not require a download, Bandai Namco has confirmed. Available for pre-order now at the Bandai Namco Entertainment Europe Online Store (PlayStation 4, Xbox One, Switch). 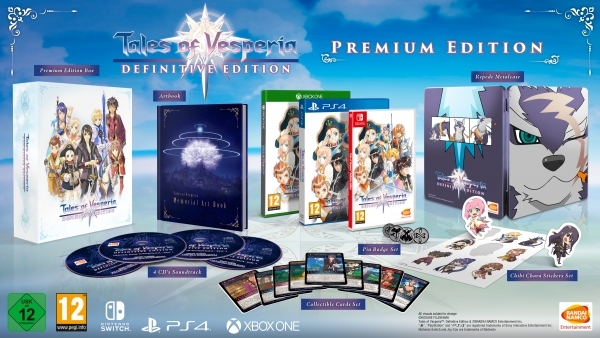 In Southeast Asia, the Tales of Vesperia: Definitive Edition Premium Edition will only be available for PlayStation 4. Tales of Vesperia: Definitive Edition is due out worldwide for PlayStation 4, Xbox One, Switch, and PC on January 11, 2019.